With a theme of Healthier the Food, Merrier the World, this year’s 5th Annual Euro Global Summit and Expo on Food & Beverages featured a passionate food safety warrior on a mission to leave people moved and ready to amp up their fight against foodborne illness — our own Senior Policy Coordinator, Darin Detwiler. 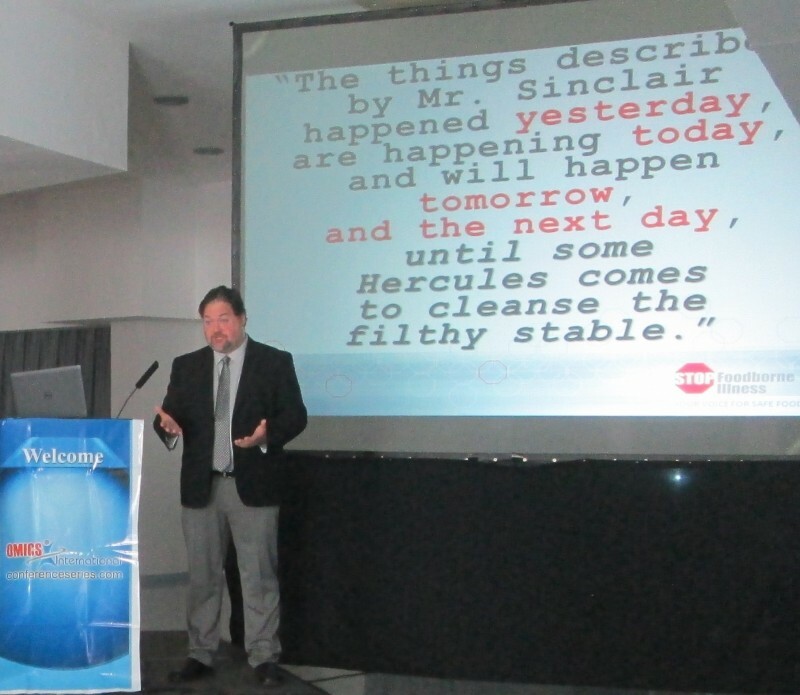 Held in Alicante, Spain on June 16-18, STOP Foodborne Illness had the opportunity to share our food safety message in a keynote address with 150+ academic and industry attendees from around the globe. Every year, this international event serves as a common platform for experts to discuss their research, and establish a scientific network between academia and industry. During this year’s event, participants collaborated and evaluated emerging issues, technologies, and innovations in the food and beverage sector. For the opening ceremony, editors of the Journal of Food Processing & Technology approached STOP Foodborne Illness requesting that we speak. Darin’s submitted proposal was accepted, affording him the opportunity to be an Honorable Guest speaking on behalf of STOP Foodborne Illness. Given this year’s theme, Darin’s goal was adding to the tracks of regulatory affairs and forensics with a presentation on America’s Regulation of Food Policy, from a victim and consumer advocate perspective. Among the broad subject matter, a few speakers focused on food safety discussing topics like the impact of freezing, the need for food safety labeling, and how poor food handling seen on European cooking shows impacts consumers’ understanding and perception of food safety. Darin’s keynote address was on the third day of the Summit. Focusing on STOP Foodborne Illness’ beginnings out of the tragic 1993 “Jack in the Box” E.coli outbreak, he noted how families came together to form STOP Foodborne Illness (then known as Safe Tables Our Priority) in an effort to prevent future illnesses and deaths from foodborne pathogens. Analyzing 20+ years of data STOP has compiled on victims, Darin showed how the trend of illnesses tied to E.coli (and USDA regulated foods) came to be slightly outnumbered by those tied to Salmonella (and FDA regulated foods). By pointing out a number of significant outbreaks over the last two decades, Darin helped participants gain a sense of how single-outbreak events have grown in the number of people and states impacted. Darin then shared several examples of international events involving large-scale outbreaks of illness and death tied to food contamination — and even food fraud. These events include the German E.coli outbreak of 2011 and the recent Chinese food scandal involving many major food retailers in America. It didn’t take long for everyone to arrive at the possibility of very real near-pandemic events from single outbreaks of foodborne pathogens impacting a greater geographical region. Imploring the audience of academics and industry experts gathered, Darin (on behalf of all STOP constituents) asked them to consider the idea that ‘the filthy stable’ is unfortunately very alive today, and how families around the world depend on their roles as ‘some Hercules’ to create a world where a family meal can be served without fear. During the “Q&A” period that followed, one statement especially stood out for Darin. A professor from New Zealand brought up the problem of supervisors within the food industry not ensuring workers under them know why food safety is important. The resulting discussion centered on the importance of communicating the true burden of foodborne illness by sharing the stories of victims and others who live with the consequences. “So many in the audience agreed. I felt so gratified, and affirmed, by their response to the work that we do at STOP Foodborne Illness!” emphasized Darin. While at the Summit, Darin met many new people with whom STOP Foodborne Illness could potentially partner in the future. Darin’s words made an impression as people tweeted and started following STOP Foodborne Illness during and after the event. As a STOP Foodborne Illness supporter, you play a big role in making it possible for Darin to attend, and for STOP Foodborne Illness to have a presence at this valuable event. Thank You! In the spirit of Darin’s important call-to-action of sharing stories, please contact Stanley Rutledge, Community Coordinator, at srutledge@stopfoodborneillness.org to share your foodborne illness experience. We’ll talk about ways we can feature it, including on our website’s Honor Wall and in our eNews.